If you are starting a new tank, then the obvious difference is that a scrubber gives you the option of not having a fuge at all because the scrubber can go on top of, in, or behind the display. There are other uses for a sump/fuge of course, but we'll only cover the filtration concerns. A not-so-obvious difference is that a scrubber, if run together with a fuge with macros, will kill the macros even though the macros are much larger. This is because the scrubber thinks the macros are nuisance algae. Some people do run both together without killing the macros, but this is just because their scrubber is not strong enough, and actually the macros might even be slowing down the scrubber because the scrubber thinks it has to remove the macros, and the nutrients in the water, and the nuisance algae in the display. However, if it works for their current setup, good. o Filtration with algae is proportional photosynthesis, which is proportional to Light X Flow X Attachment. Meaning, stronger light grows more algae; stronger water flow grows more algae; and stronger attachment lets more algae grow without it floating away. A scrubber is designed to maximize Light, Flow, and Attachment. o The main problem with macros in a refugium is the self-shading that the macros do. Any part of the macro which is not directly in front of the light at any moment is not filtering. And any macro inside of a "ball" of macro (like chaeto) is self-shaded all the time. Only the surface macro that is directly in front of the light is doing any real filtering. 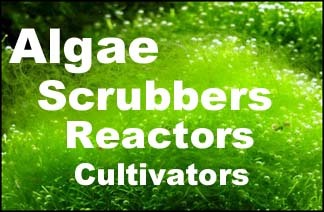 A scrubber is designed to have all the algae in front of the light at all times. Rotating the macro does not solve the problem because the time that the macro is rotated away from the light is time that the macro is not filtering. This is why it takes a much larger size of chaeto to do the same filtering as a scrubber. o Particle trapping is another result of a ball of macro. These particles need to cycle back around to feed the corals, but instead they get trapped in the macro and rot, and in doing so they block even more flow and light. o The turbulence of water moving over the sections of algae in a scrubber help to remove the boundary layer of water around the algae. This boundary layer slows the transfer of metabolites in and out of the algae. There is no turbulence in a fuge (if there were, you'd have waves and bubbles). o Scrubbers do not (if cleaned properly) release strands into display, like chaeto does. o Scrubbers do grow lots of pods; more than was previously thought. 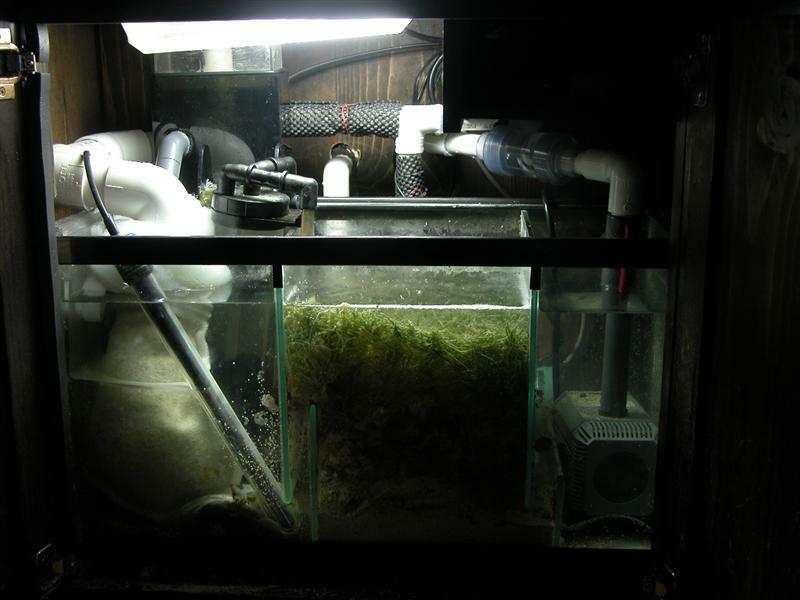 However, if you already have a sump with an empty compartment, and you don't mind using all of it and putting a light over it, then maybe it's easier and cheaper to try macros than even a DIY scrubber. Last edited by SantaMonica; 08-13-2014 at 09:15 PM. any idea its better i uninstall the refugium tank or just leave it that way ??? Remove macroalgae from refugium. You can leave rock and sand in the refugium. This I do agree with. One thing to add is that flow also remove oxygen which is produced by photosynthesis, and one recently posted study showed that if the O2 is not taken away via water flow, it tends to "stop things up" and reduce photosynthesis rates (explanation greatly simplified). This would be the case especially in a large tight ball of chaeto. Yup thats my opinion! probably they scrambling food between algae from ATS and macroalgae. I made create the water flow on ATS over and over back to the screen, finaly to refugium tank then return pump. feeding times for ATS more than refugium tank. SM : cause there is no macroalgae on my refugium tank, so that is called RDSB tank now ??? does it need light (daylight) on my refugium tank ??? I have the same problem with this one. You mean "no" no need light on refugium tank or "no" this not called RDSB Tank ? No need for light if there is nothing photosynthetic in the "refugium" anymore. A RDSB doesn't need light at all. I never had a better functioning SPS reef than when I had this as my sump. 15G sump on a 75G tank, middle chamber STUFFED with Caulerpa (bottom completely shaded as you can see, but still green and still grew fine). To me that is like saying trees can't grow branches and leaves below the top of the tree because the top canopy blocks the light for the leaves below.. but we know that isn't true either. For 2 years before I moved to an ATS this is how I ran it, and for 2 years I never had ANY detectable phosphate readings and the macro algae just grew and grew without problems, die off, or going sexual (same with my SPS corals, I was getting 12" inches a MONTH of growth on certain acropora!). Actually, this sump is the same sump I used on a 29G tank previously before I upgraded, so the sump was actually 7+ years old before I moved it to my upgraded/new 75G tank at the time. I had many other locals come over with their own Hanna meters to test my tank and verify themselves it was always a 0.00 reading. I did use GFO as well at the time, but only 1/4 cup in a TLF reactor and only changed it once a month. Since switching to an ATS I have, since day 1, had a phosphate problem and no matter how many different ways I try and remedy the situation, I can't seem to make an ATS work anywhere close to what my old refugium use to run... but I still try because I do think the ATS is a great filtration method, but I also think it requires some other methods beyond what I used to use in the picture below because I went from using 1/4 cup of GFO a month to 1 cup of GFO a week and even at 1 cups worth, it was spent in 7 days and could never bottom out phosphates to 0.00 like I used to get, best I ever got was 0.03 when using lanthanum + phosguard and that only lasted a day before phosphates were on the rise again. If algae were the cause of the phosphate problem, you would have had the problem with the chaeto too. Ok I got it. thx.